Posted by Berry, John W.
Successful intercultural relations: how shall we all live together? What is the key to achieving more positive intercultural relationships? Drawing on research evidence from 17 culturally plural societies, this column calls for the development of policies and programs that provide cultural space for all groups to feel secure in their place in society, offer opportunities for intercultural engagement, and encourage the maintenance of multiple identities and ways of living together. There is probably no more serious challenge to attaining social stability and cohesion in the contemporary world than the management of relations within culturally plural societies. These goals are important to achieve because they underpin mutual acceptance and trust across cultural groups. Their successful attainment depends on many factors including a research-based understanding of the historical, political, economic, religious and psychological features of the groups in contact. This is not a new question, but it is one that has become increasingly salient. I am part of a team of international researchers who are examining three core psychological hypotheses about intercultural relations in 17 culturally plural societies: Australia, Azerbaijan, Canada, Estonia, Finland, Germany, Greece, Hong Kong, India, Italy, Latvia, Malta, Norway, Portugal, Russia, Spain and Switzerland. The multiculturalism hypothesis: that confidence in one’s identity will lead to the acceptance of others and reduction of discrimination against others. The contact hypothesis: that intercultural contact will usually promote mutual acceptance. The integration hypothesis: that when people engage in and identify with both their heritage cultures and other groups in wider society, they will achieve a higher level of psychological and social wellbeing. The main goal of the project is to evaluate these three hypotheses across societies in order to identify some basic psychological principles that may underlie successful intercultural relations. The eventual goal is to employ the findings to propose policies and programs that will improve the quality of intercultural relationships globally. We have been using a common research tool to examine personal and group characteristics including cultural identities (ethnic and national); feelings of cultural, economic and personal security; preferences for various acculturation strategies (such as integration, assimilation, separation and marginalization); contact with other cultural groups; tolerance, prejudice and the experience of discrimination; and wellbeing (psychological and socio-cultural). 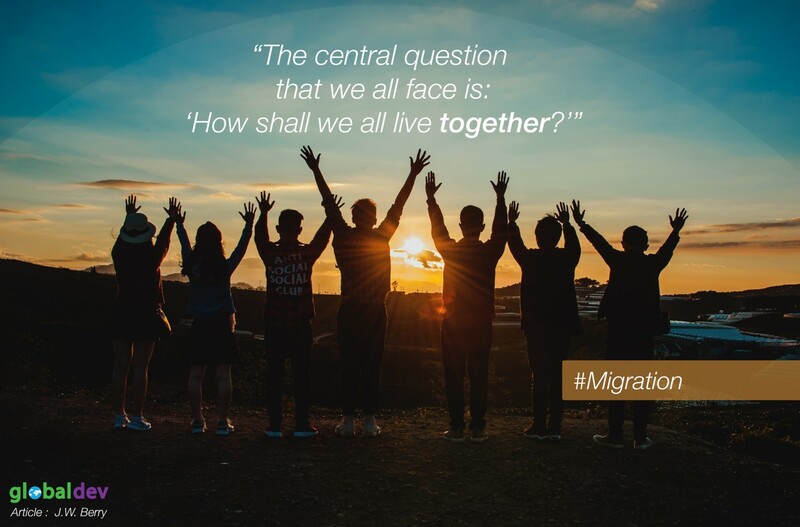 We have consulted immigrants, refugees, migrant workers, international students and ethno-cultural groups (national minorities), as well as members of the dominant groups in each of the 17 societies. We find evidence to support each of these three hypotheses in approximately 80% of participants. We also identify important factors associated with each hypothesis. First, with the multiculturalism principle, it is clear that having confidence in and feeling secure about one’s place in society leads to more positive mutual attitudes. In contrast, when people feel threatened or experience discrimination, hostility is the likely result. Second, with the contact principle, engaging in intercultural relations and sharing cultural experiences leads to more positive mutual regard. In contrast, when there is social exclusion that limits or prevents intercultural contact, negative relationships are likely to develop. Third, with the integration principle, using the strategy of identifying and being involved with both or many cultures (integration) is indeed associated with better psychological wellbeing (life satisfaction and mental health) and better socio-cultural competence than if other strategies such as assimilation, separation or marginalization are adopted. Encourage the maintenance of multiple identities and ways of living together in plural societies. John W. Berry is Professor Emeritus of Psychology at Queen's University, Canada, and Research Professor, National Research University Higher School of Economics, Moscow, Russia. I agree with the hypotheses mentioned, however I consider that the way to proceed depends on your situation. It is not the same if you work in a foreign country and coexist with natives on a daily basis than if you live in your country but work with foreigners or if you have an intercultural relationship (in foreign country or in your own country). Being an expatriate living in an intercultural family in a foreign country, I consider that we have to face two situations: the first one is “The cultural shock” and its stages (Kalervo Oberg) and, at the same time, we face Cultural differences within your own family where it is important to know who you are (multiculturalism), know the culture of your partner (contact) and try to mix both cultures (integration). However, sometimes it is impossible to know if you still are in the cultural shock or you are trying to understand yourself or your partner or the culture of the country that adopted you. Kalervo Obeg mentioned this in his article: that if your basic needs are not fulfilled it will be impossible for you to overcome the cultural shock, so in this case it won’t be possible even to try to be in contact with any person or try to integrate both cultures. I am not saying the hypothesis are incorrect but, how can they be applied in this case? And, what about the children whose parents come from different cultures? in that case would it be considered a new hypothesis? because they do not have totally defined what culture they belong to. Maybe would it focus more on the culture of the country where they live in? but will they feel really identified? or will they acquire the identity of the culture that works better for them?